Home Food & Nutrition Pedialyte for Dogs: Can Dogs Have Pedialyte? Pedialyte for Dogs: Can Dogs Have Pedialyte? ​Pedialyte is a wonder home remedy as popular as sodium bicarbonate (AKA baking soda). It can cure dehydration caused by stomach flu, food poisoning, or travel sickness. You can drink and rehydrate with Pedialyte after running a marathon, exercising or chasing Fido all around the house for stealing your socks. ​Can ​I Give My Dog Pedialyte? Is Pedialyte Safe for Dogs? Can Dogs Have Pedialyte? Is Pedialyte Safe for Dogs? Pedialyte is a wonder home remedy as popular as sodium bicarbonate (AKA baking soda). It can cure dehydration caused by stomach flu, food poisoning, or travel sickness. You can drink and rehydrate with Pedialyte after running a marathon, exercising or chasing Fido all around the house for stealing your socks. ​Answer: Yes, Pedialyte is safe for dogs. ​According to Abbott Laboratories, the manufacturer of Pedialyte, it is a “medical-grade hydration solution formulated with sugar and electrolytes.” It can replenish the loss of vital fluid in the body that can be administered to infants, children and even ​to cure hangover for adults. Vets give their nod, too, like Dr. Jennifer Coates of ​petMD. Pedialyte could be an instant lifesaver when your pooch is suffering from dehydration and diarrhea. According to Abbott Laboratories, the manufacturer of Pedialyte, it is a “medical-grade hydration solution formulated with sugar and electrolytes.” It can replenish the loss of vital fluid in the body that can be administered to infants, children and even to curadults to cure hangover. Vets give their nod, too, like Dr. Jennifer Coates of PetMD. 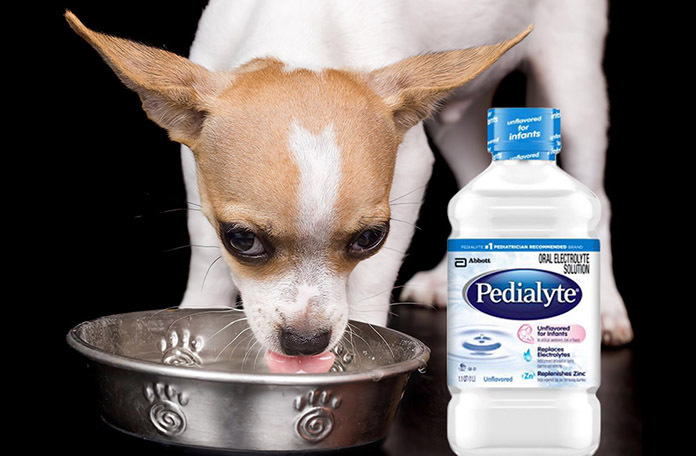 Pedialyte could be an instant lifesaver when your pooch is suffering from dehydration and diarrhea. Of course, dogs can’t tell you that. ​Dogs are furballs of energy. They could spend hours running, jumping, rolling and swiping that fried chicken on the dinner table. You still love them to bits though. Other than Pedialyte, let them lick ice cubes if they don’t feel drinking from a dog bowl in order to beat the heat. Dogs are furballs of energy. They could spend hours running, jumping, rolling and swiping that fried chicken on the dinner table. You still love them to bits though. ​Yes, your dog can also have an upset tummy, and you’re affected as well. No amount of belly rub can lessen their canine anxiety. Yes, your dog can also have an upset tummy, and you’re affected as well. No amount of belly rub can lessen their canine anxiety. As a pet owner, it is your responsibility to take care of your dog’s health and well-being. There is an exception to that rule. It is understandable you’re not always with your dog at all times because of work and to do other human-ly things. For example, while you’re away, you will never know what your dog is doing when their snout is buried on your precious garden patch. Okay, bad dog. ​How Much Pedialyte Can I Give My Dog? 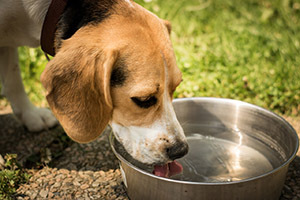 It is now clear that Pedialyte for dogs is safe, but how much Pedialyte for dogs should you give once Fido experiences the symptoms of dehydration or diarrhea? As advised by petMD, "administer an electrolyte solution at a rate of 2 to 4 ml per pound (1 to 2 ml per kilogram) of the dog's body weight per hour.” Or you can give your dog a bowl containing 50:50 dilution of Pedialyte (mix 1 part Pedialyte with 1 part water). How Much Pedialyte Can I Give My Dog? It is now clear that Pedialyte is safe for dogs, but how much Pedialyte should you give once your dog experience the symptoms of dehydration or diarrhea? As advised by PetCareRx, it “should be at least 15 mL per pound of body weight per day.” Make sure it is 50:50 dilution of water and give it to them in quarters or 4 times a day. If they’re unable to drink from a dog bowl, you can manually feed them by using a needleless syringe. Just do it slowly and carefully as possible. Take into account that Pedialyte is not an alternative to water and should not be given to healthy dogs. It contains potassium, zinc, chloride, and sodium. The last ingredient, sodium, when taken excessively by healthy dogs can make them sick and, worse, can lead to seizures. ​If they’re unable to drink from a dog bowl, you can manually feed them by using a needleless syringe. Just do it slowly and carefully as possible. ​Can I Give My Dog Flavored Pedialyte? Can I Give My Dog Flavored Pedialyte? ​Yes, if they’re not interested drinking the unflavored Pedialyte. There are four flavors in the market such as mixed fruit, strawberry, grape, and bubble gum. Yup, it comes with bubble gum flavor too. Remember our take on ice cubes can be given to dogs? Pedialyte Freezer Pops do exist! It is all flavored though. Each Pedialyte Freezer Pops Variety Pack comes with grape, blue raspberry, cherry, and orange flavors. Yay, every dog’s dream: flavored ice cubes. Yes, if they’re not interested drinking the unflavored Pedialyte. There are four flavors in the market such as mixed fruit, strawberry, grape, and bubble gum. Yup, it comes with bubble gum flavor too. ​Serious Case of Dehydration or Diarrhea? Visit the Vet Now! Serious Case of Dehydration or Diarrhea? Visit the Vet Now! ​If you sense that giving an electrolyte drink is not enough to cure your dog’s illness and his condition doesn't improve at all, then visit a veterinarian as soon as possible. Besides ice cubes and Pedialyte, do you know other alternatives or home remedies that can cure a dog’s dehydration and diarrhea? Are they much fun—in the case with dogs—than ice cubes? Bummer. Share your suggestions in the comment section! If you sense that giving an electrolyte drink is not enough to cure your dog’s illness and his condition doesn't improve at all, then visit a veterinarian as soon as possible.